Hobbes: Why waste time learning, when ignorance is instantaneous? Calvin: Isn’t it strange that evolution would give us a sense of humor? When you think about it, it’s weird that we have a physiological response to absurdity. We laugh at nonsense. We like it. We think it’s funny. Don’t you think it’s odd that we appreciate absurdity? Why would we develop that way? How does it benefit us? 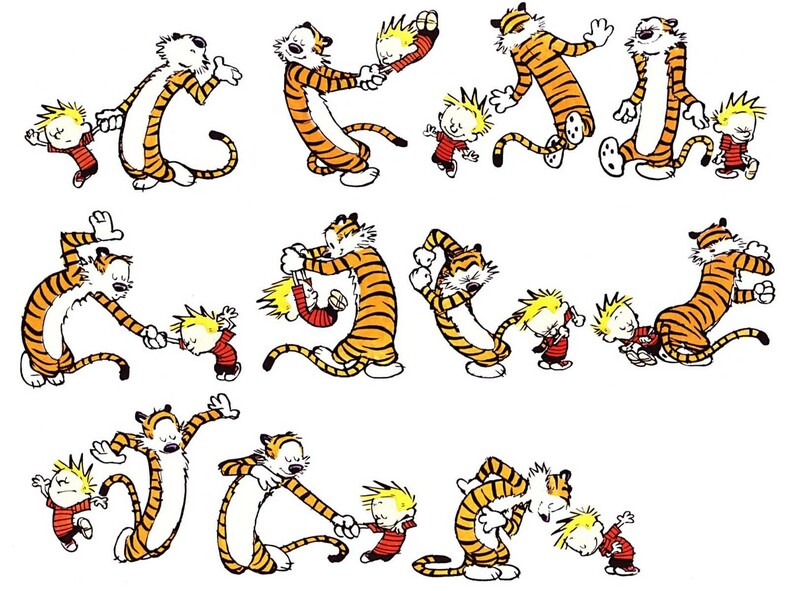 Hobbes: I suppose if we couldn’t laugh at things that don’t make sense, we couldn’t react to a lot of life. Hobbes: How come we play war and not peace? Calvin: Too few role models. Calvin: I’ll be the fearless American defender of liberty and democracy… and you can be the loathsome godless communist oppressor. We’re at war, so if you get hit with a dart, you’re dead and the other side wins, OK? 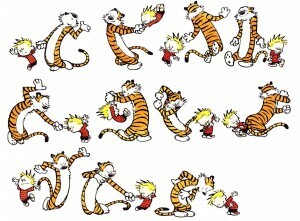 Calvin: GO! (WAP-WAP they shoot each other simultaneously) Kind of a stupid game,isn’t it? Calvin: Dad, where do babies come from? Calvin’s Dad: Most people just go to Sears, buy the assembly kit, and read the instructions. Calvin: I CAME FROM SEARS?!?! Dad: No, you were a Blue Light Special at Kmart. Almost as good, and a lot cheaper. Calvin’s Mom: Dear, what are you telling him now?! Calvin: I was reading about how countless species are being pushed toward extinction by man’s destruction of forests. Sometimes I think the surest sign that intelligent life exists elsewhere in the universe is that none of it has tried to contact us.